Please also note that we cannot comment on individual cases without taking a proper history and conducting a full examination. The nervous system, (NS) is a system that can become involved in any injury or over strain. The nerves can be damaged directly or be indirectly affected by other tissues. There may not even be any obvious injury but nerve tissue can be affected by poor posture and/or repeated awkward movements. Even very minor injury to nerve tissue can lead to scarring and therefore tethering which in turn affects the mobility and glide of a nerve. It only takes a minor injury to make a nerve behave differently. Even if the nerve tissue is not injured, we have to remember that the majority of tissues in our body have a nerve supply and that ‘error messages’ of any damage, are sent to the brain via the nervous system. These may contribute stimulate our protective mechanisms such as muscle spasm. The NS is, (in simplified terms), like “one long piece of string” and injury in one area can lead to repercussions in other parts of the body. One of the most common nerve injuries that you hear about is sciatica, which is a complaint which many people visit the Physiotherapist and Osteopaths here at the Adur Osteopathic Clinic to seek help. However, many people do label any pain referred from the spine as ‘sciatica’, which is technically incorrect. True sciatica involves injury to the root of the nerve in the lower part of the spine and causes referred pain down the back of the leg and often includes sensory, (sensation), changes such as tingling or numbness, and possibly weakness. 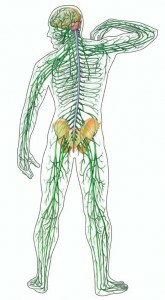 The nerve roots a little higher in the spine can send, (refer), pain down the front of the thigh and leg. Pain and symptoms from the trunk level can radiate round the sides or even into the front of the chest. Nerve involvement in the neck region can cause symptoms to be referred down the arms. The nervous system is so widely spread in the body that referral potential is such that no area of the body is exempt; however, there are patterns of symptoms and area distribution, which give us valuable clues to location and nature of injury. It is when our Osteopaths and Physiotherapists see and hear of symptoms that don’t fit a familiar pattern that they may suspect nerve tissue involvement.